This jersey has been personally signed by Penguins All-Star Evgeni Malkin. 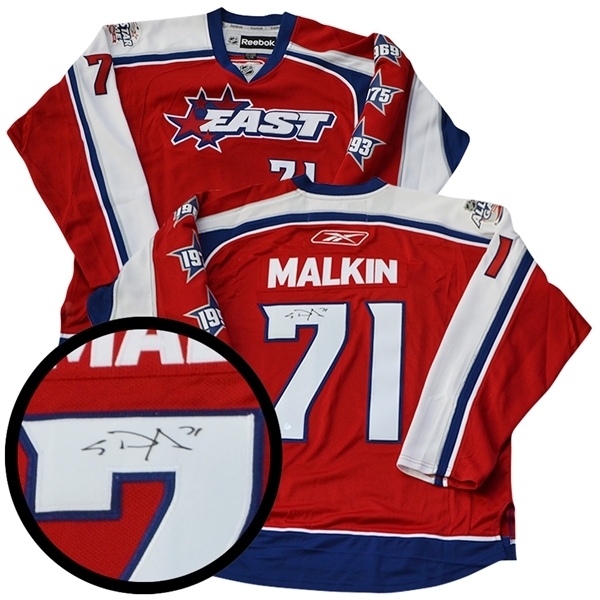 The number ‘7’ is the signed of the #71. This jersey features a red, white and blue colour scheme with the "EAST" logo on the front, representing the Eastern Conference. On the left side of the arm it features the three previous years the Montreal Canadiens hosted the All-Star Games. Malkin has been a huge threat on the Penguins offense since joining the team in 2006. 2009 Was a milestone year for Malkin reaching a significant number of his career highs including of 78 assists, 113 points, and 41 power-play points. In 2009, Malkin took home a hand full of accomplishments and awards. He started by being selected to the NHL All-Star game, he won the accuracy competition as the most accurate shooter in the NHL. Malkin was named to the First All-Star team, became the second Russian born player to win the Art Ross trophy, and earned the Conn Smythe Trophy. Malkin also led the team in the playoffs with 36 points in 24 games to help secure the Stanley Cup victory. This jersey comes accompanied with a Frameworth hologram and COA to ensure the authenticity of the autograph. We do not guarantee any specific jersey sizes but we typically carry sizes L, XL or 52, 54 & 56 for jerseys. These sizes are considered the most ideal for framing & displaying.